Measure the differential pressure between any two points in your closed process volume, and control flow at a different point to ensure the pressure differential remains constant. 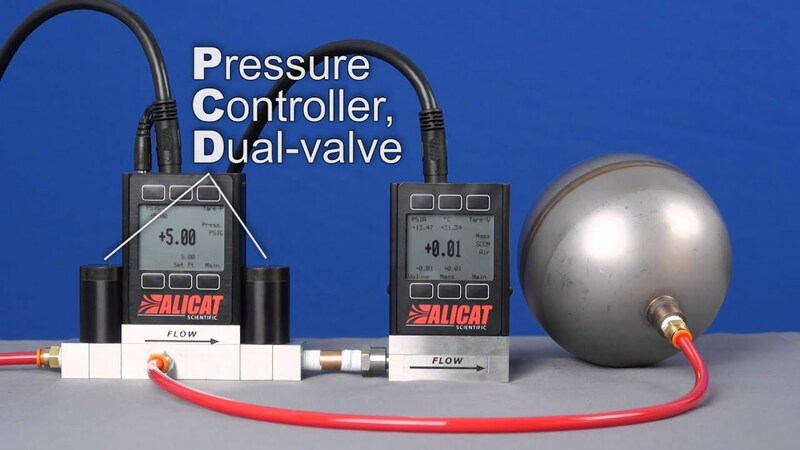 Alicat’s PCD series dual-valve pressure controllers use two proportional valves to precisely control the pressure of gases within dead-ended volumes. The two process ports connect to opposite sides of the differential pressure sensor; positive readings denote higher pressure at the left (upstream) process port, and negative readings denote higher pressure at the right (downstream) port. We’ll use your application parameters to customize your valve and PID tuning to ensure that your controller delivers fast and stable control. Efficient & Versatile. The dual-valve design incorporates a second proportional valve to exhaust excess pressure, but only when needed to maintain your setpoint. Plumb the two pressure ports wherever you need to measure and control the pressure difference. Or use the instrument as a gauge pressure controller by leaving the downstream port open to atmosphere. To characterize a valve’s flow vs pressure curve as it would be used on Mars, Alicat’s dual-valve differential pressure controller can cycle through several pressure differentials that are all referenced to the simulated Martian atmosphere instead of Earth’s own atmospheric pressure. Plumb the downstream differential pressure port to the closed atmospheric chamber and the upstream one to the line that supplies pressure against the valve.